Hand-assisted laparoscopy in urology was initially (4) and has been most frequently applied to renal disease. Concurrent with the more recent interest in laparoscopic prostatectomy and cystectomy, hand-assisted laparoscopy has been applied as well. A pure hand-assisted laparoscopy radical prostatectomy has not been reported, although authors have described open surgical prostatectomy through the lower midline incision used to place the hand-assisted laparoscopy device for concomitant radical nephrectomy (52,53), but hand-assisted laparoscopy cystectomy has been described. In their series of multiple-organ removal using hand-assisted laparoscopy, Troxel and Das reported a case of simple cystectomy for pyocystis performed at the same time as simple nephrectomy for pyonephrosis. The first published description of hand-assisted laparoscopy radical cystectomy for urothelial carcinoma of the bladder was from Peterson et al. in 2002 (54). The ileal conduit urinary diversion was created with open surgical techniques through the incision for the hand-assisted laparoscopy device. The operative time was seven hours, there were no complications, the patient was discharged from the hospital seven days postoperatively, and he was back to work four weeks postoperatively. One of the authors (JSW) performed a similar (unreported) case in 2000, although the patient remained in the hospital for eight days postoperatively and suffered a small bowel obstruction requiring adhesiolysis six weeks postoperatively. 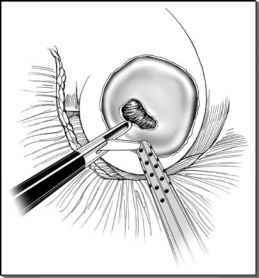 The only series of handassisted laparoscopy radical cystectomy has been described by McGinnis et al. (55). In all seven patients, the hand-assisted laparoscopy device was placed through an infraum-bilical midline incision. The cystoprostatectomies (all patients were men) were performed with hand-assisted laparoscopy and four laparoscopic ports, followed by open surgical ileal conduit urinary diversion through the hand-assisted laparoscopy incision. Of the seven procedures, one was converted to open surgery following cystoprostatec-tomy for failure to progress with the dissection of lymph node encircling the right external iliac vein. For the six cases completed with hand-assisted laparoscopy, the average operative time was 7.6 hours and the estimated blood loss was 420 mL. After a use of an average of 28.8 mg morphine equivalents, the patients were discharged from the hospital three to six days postoperatively (mean, 4.6 days). Aside from the one conversion to open surgery and two patients requiring transfusion of one and two units of blood, there were no other postoperative complications. All margins were negative except for one right ureteral margin positive for carcinoma-in-situ on final reading. Of the patients, two had positive pelvic lymphadenectomy specimens and received chemotherapy; one had progression of metastatic disease and died. Of the remaining five patients, all with negative pelvic lymphadenectomy specimens, one died of unrelated causes eight months postoperatively, two have no evidence of disease, and two developed local recurrences. The latter two are particularly concerning; a 29% pelvic recurrence rate is higher than expected. Although this may be simply an artifact of a small case series, it deserves further consideration.